Our Project Management process is designed to effectively manage change, drive competitive advantage, and deliver high quality results and best value services both on time and within budget. 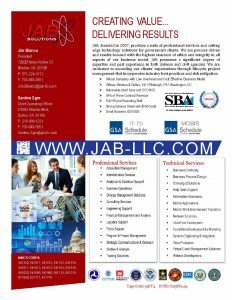 At JAB, we believe that contract management support is driven by proven processes, customized, automated tools, and experienced, detail oriented professionals. We understand that poor contract management can result in delays and frustration for program offices. Conversely, diligent and comprehensive program management that provides accurate and readily available program data can be the program office’s most effective management tool. Many projects start with ill-defined requirements which is the number one reason for cost and schedule overruns leading to project failure. Our requirements definition process and tracking methodology reduces project risk and adds greater probability of project success. On order to ensure that standards of quality are being met, it is critical that the PM practice systematic monitoring and evaluation of the various aspects of a project, service, or facilities applying both standardized metrics ant those developed to address the unique aspect of each project.